WB Games and IO Interactive announced Hitman 2 during a livestream today. The game brings back Agent 47 for new missions where a conspicuous bald chef takes the place of Steve, who stepped around the corner for a smoke break. 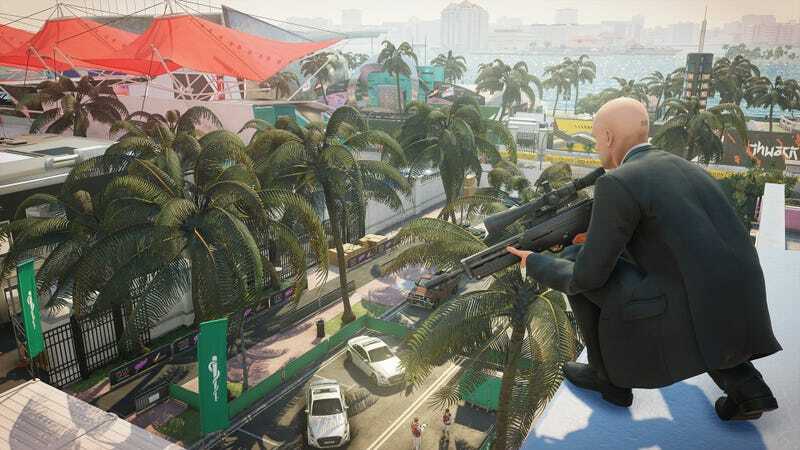 Hitman 2 will feature locations like rainforests and a racetrack in Miami, which seem like very nice places to assassinate someone. Agent 47 will try to hunt down the elusive Shadow Client and a cabal of targets, who are presumably very nasty dudes. It will also feature a co-op, Sniper Assassin mode. Today, publisher WB Games announced that the game will release on November 13th for Playstation 4, Xbox One, and PC. Unlike 2016's release, levels will not be released episodically. IO Interactive revamped the Hitman franchise in 2015, releasing individual levels as part of an extended season of content that was really great. They continued to update the game with features such as elusive targets—limited time, one attempt only targets. The studio later broke off from publisher Square Enix and re-established itself as an independent entity, retaining the rights to Hitman. We’ll hopefully learn even more next week at E3.